If you’re a media company looking to drive more advertising revenue from the brand/direct and direct response television industry, you’ve come to the right place. Since deploying our AdSphere™ system in late 2014, over million short form airings have been detected in addition to over infomercial airings. Today, AdSphere™ monitors over networks. 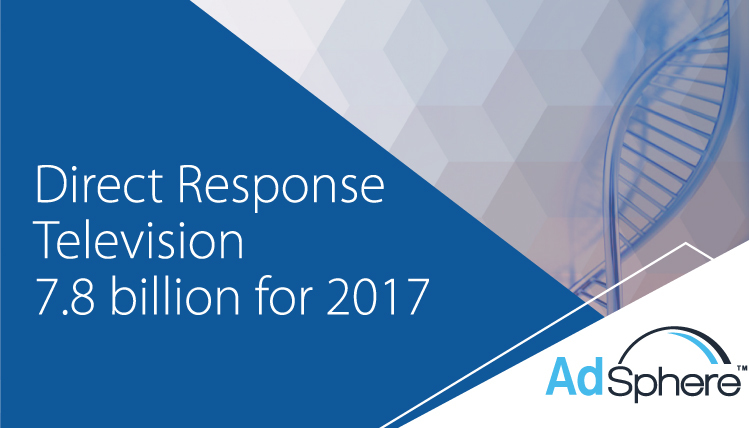 Industry short form billings were over 7.8 billion based on our 2017 industry study. To make sure your media properties are receiving their fair share of these market dollars, DRMetrix has developed AdSphere™. Pattern and optical character recognition technologies combined with ACR detects new commercials with phone, URL, price points, etc. unique responsive creatives identified to date. First competitive media research system to monitor all ad formats including spot, 5 min, and 28.5 minute. airings detected to date. Airings reported within 30 minutes of airtime. No more waiting 4-6 weeks for data. National cable airings segmented and valued based on break type. No other competitive media system monitors commercial grade network feeds in a DPI compliant manner. Full Video playback of all creatives including spot, 5 min, and 28.5 minute. Ability to segment campaigns using DR variations (ie: different 800 number or promotion codes) from brand/direct campaigns (using vanity call to action). Compare your networks share-of-market by advertiser, brand, creative and/or by industry category against any other group of networks monitored by DRMetrix ( to choose from). Discover new opportunities across any or all industry formats: short form, 5 min, and 28.5 minute. The days of erroneous and misleading data are over. DRMetrix monitors commercial grade network feeds in a DPI compliant manner. We never report MVPD airings as national or overvalue schedules. The underlying data that our share-of-market reports are built on is industry leading. Compare what advertisers, brands, and creatives are spending on your network against seven other networks of your choosing. Each group of eight networks is considered a comparison set. You can create as many comparative sets as you wish for any date range including for the current media week! Filter for any combination of creative lengths to determine your network’s share-of-market for spot, 5 minute, or 28.5 minute infomercial business. Determine which campaigns are spending the most across your chosen universe of networks and discover advertisers, brands, and creatives that are running on competitive networks. The sample report below is a brand centric share-of-market analysis across eight networks. We can see that the brand with the top spend is State Farm representing a 4.09% share-of-spend against all other brands running across the eight networks for the period. As you look across each network column, you’ll see how that 4.09% is attributed to each network. 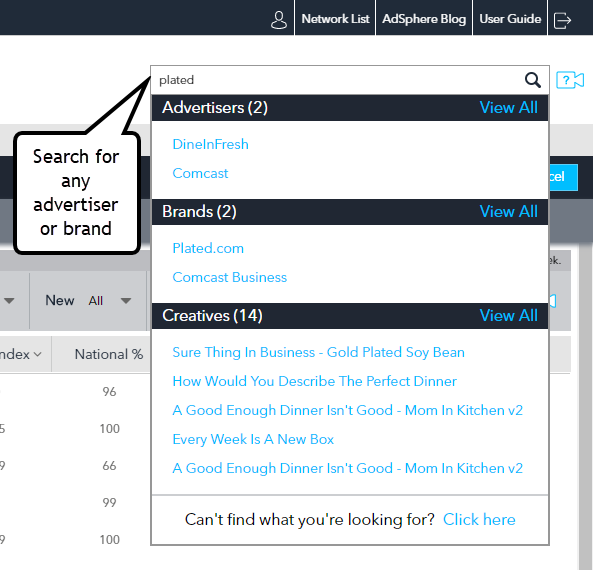 Sort any network column to see top brands as well as brands where the network has a zero or subpar market share. The sample report below is an advertiser share-of-market analysis. For the networks and time frame in question, AT&T Services has two brands on air representing the top spend compared to all other advertisers. Expand the brand column for any advertiser and expose brand level share-of-market details. Expand the creatives column for any brand to drill down and see the share-of-market for each individual creative. Click on any share-of-market value to drill into media execution details across all networks or any individual network. Understand historical airing trends including day of week, hour of day, and/or daypart trends. Export creative detail, summary, and even complete airing details. For network business development, AdSphere™ has built the industry’s largest advertiser contact database complete with phone, email, and social media links. It’s easier than ever before to identify, qualify, and contact these valuable targeted prospects. 1 When did the spot or infomercial run? Please allow us to share AdSphere™ with you and your team. To schedule a screen share demonstration and free trial please click here.